Hurricane Ophelia, which made history as the first major hurricane recorded east of the Azores, reached Ireland as a tropical storm with devastating wind speeds. Wind gusts were recorded at 109mph (176km/h) at Fastnet Rock, an island off west Cork. The Irish weather service, Met Eireann, described the storm as life-threatening. About 230,000 homes are currently without power in the 26 Counties, where a red alert has been declared. Schools and colleges are closed, as is most public transport. Dublin Airport said about 130 flights were cancelled, and most businesses have closed early. While the southwest recorded the strongest winds, fallen trees and telephone poles blocked roads across the south. The Electicity Supply Board said power cuts were largely in the southern half of country, and that it would take several days to restore power. There was tragedy in the Aglish area of west County Waterford, where part of a tree fell on a woman's car, killing her and injuring a passenger. 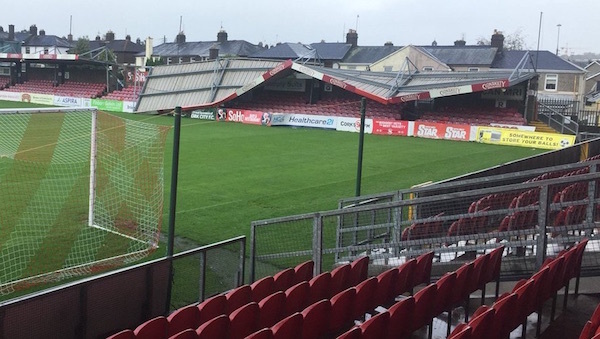 Part of Turner's Cross stadium in Cork city collapsed in the winds (pictured), while part of a roof of a stand at a Gaelic sports club in nearby Passage West was lifted away by a gust. In a statement to the Irish people, the 26 County Taoiseach Leo Varadkar said Ophelia was a dangerous storm and advised people to stay indoors until it had passed. In the north of Ireland, where the worst of the storm is yet to come, the British weather service declared an amber alert, while the British Army was put on standby.